Chase'n Our Dreams: My Big Fat Obsession...AGAIN! Oh, the joys of summer...swimming, freshly squeezed lemonade, sunshine, and...NEW TV SHOWS!!! 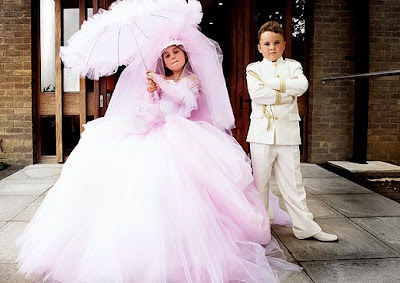 TLC just aired a new show this past Sunday, My Big Fat Gypsy Wedding. 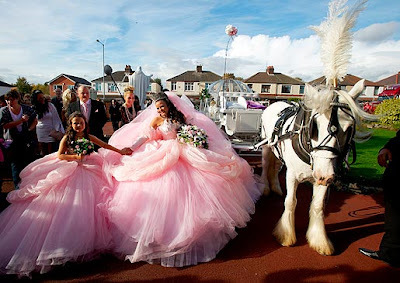 The show documents that weddings of Gypsies, or Travelers, in the UK. Typically, the average age of the bride in this culture is 16-17. The first episode that I watched followed 17 year old Sam as she prepared for her wedding day to 20 year old Patrick. While their outfits tend to be scandalous, their morals and ethics are very strict. Her dress weighed more than she did and had lights that lit up with battery packs attached to them. Girls want bigger and bigger dresses. Some dresses cause their hips to bleed...in their eyes, the bigger the scars on their hips, the better the marriage will be. Gypsies are devote Catholics so even first comuninions are a major milestone. This little girl's first communion dress weighed double her weight, but she LOVED it! If you aren't hooked, I'll be surprise! Have you seen it? What do you think?